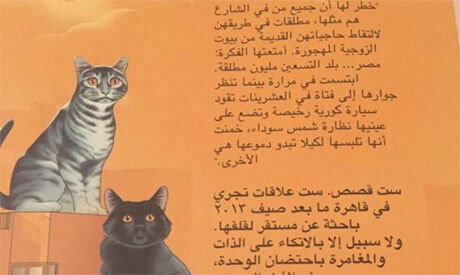 Dar El-Tanweer published the first collection of stories for scriptwriter Muhammad El-Hajj, titled Nobody Pities the Cats of the City. Each story takes place in the heart of middle-class Cairo during the heavy days of the summer of 2013 and, on the surface, appear to be accounts of men and women in their late 20s or early 30s who are at a loss for meaning in life and for love. However, as Muahmmad El-Hajj stated in an book discussion hosted recently by the Netherlands-Flemish Institute in Cairo, his six short stories “are not just about love; [they are] about love but really not just about love." In essence, El-Hajj's stories are about dismay, broken expectations and impasses that people walk themselves into as they fall in love with the wrong people, fail to think ahead or exaggerate their expectations. “All of which is compatible with the sentiments of the January Revolution that went astray, perhaps by the hand of its own people,” El-Hajj suggested. “The result is not just the loss of a dream for a new social contract that could have given the city we are living in a bit of sensibility, to put aside all the big dreams, but rather the result is a sense of sadness that we had to face ourselves." “Life could be generally sad," as one of the leading characters of El-Hajj’s stories remembers her mother saying. Almost every single protagonist in the six pieces seems to think, say or feel the same throughout the more than 150 pages, which read like a novel, or maybe an abridged literary biography of the author. “Not a biography – certainly, [but] there are always elements there of one’s own experiences,” El-Hajj said. This was one reason he chose not to turn his consecutive literary sequel into a novel. He wanted it to reflect the various stories of people who shared a dream, maybe a dream of love or of something else, and who could not complete what was required of them to fulfill this dream. According to El-Hajj, if anything, his stories are more of a testimony to the bewilderment that is haunting the unaccomplished dreamer, the figure who is not unaware of her or his own failures but who must nonetheless move on, as straight up as possible, in search of a shelter or of some compassion – just like the homeless cats of the city. “But this is not necessarily the account of completely miserable fates. There is still room for something positive and maybe for hope, despite the misery,” El-Hajj argued. The aching and yearning is firmly there, deep even if sometimes hidden – but so are the smiles, compassion and pleasure, even if temporary. As expected of a scriptwriter, El-Hajj's stories have very distinct scene settings, very real-to-life dialogues and very detailed characterization. “I thought about having some of these stories as films, originally, but it did not happen, at least not then. But it could still happen - maybe later,” he concluded.